CLEMSON, S.C. - Sophomore Evan James scored in the first half as the Charlotte 49ers men’s soccer team tied Clemson 1-1 in double overtime. The 49ers finished the game with a season-high 20 shots. The game had a 40 minute lightning delay six minutes into the first overtime. 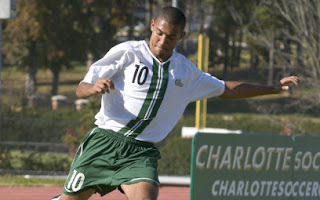 James gave the 49ers (1-1-1) an early lead when he scored off an Adam Gross assist in the 10th minute. James’ goal was his first of the season and his seventh of his career. Clemson (0-2-1) tied the score when Nathan Thornton scored in the 75th minute. Charlotte’s finished the game with a 20-12 advantage in shots. James led the 49ers with 10 shots including five on goal. Isaac Caughran had three shots for the 49ers. The 49ers return to action when they host Campbell in their season home opener at 7 p.m. Saturday.